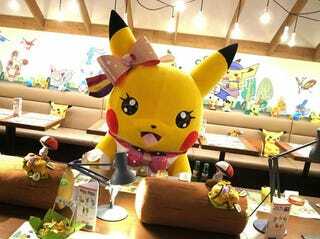 Tokyo is home to a new Pokémon Omega Ruby and Alpha Sapphire cafe. It serves up an array of Pikachu-themed treats. Gotta eat 'em all! The cafe, dubbed Pokémon Cafe Ω Ruby & α Sapphire, opens this Friday in Tokyo's Shibuya. As website Sibch.tv points out, the cafe is opened only for a limited time, and slated to end its run in late February. Below, you can get a look inside the cafe. Even the staff are all Pikachued out. And via Street Girls Snap and Fashion Press, here's what will be served.